In this tutorial we will see a special case of high availability scenario using HSRP with object tracking. Most modern enterprise networks in today’s deployments require some form of high availability depending on the uptime needed and the criticality of the service. The network infrastructure elements that are usually needed to be highly-availability include network devices and communication links. Let’s discuss first some important features and theory behind HSRP combined with object tracking for implementing high availability in Cisco Networks. If you are new to the networking world you may ask yourself “What is HSRP, do I really need it, when to use it?” I will try to explain why and how to use it but first a brief introduction will be useful. HSRP is part of a select list of redundancy protocol suites named generic First Hop Redundancy Protocols. These protocols include also VRRP (Virtual Router Redundancy Protocol) and GLBP (Gateway Load Balancing Protocol) and they all do the same thing ensuring high availability of the gateway device and load balancing if required. The state of the routers after the election that designates how traffic will flow. The Active router uses the virtual IP and MAC addresses of the HSRP group and the standby router listens for hello messages sent by the active router and assumes the active state if no hello messages are received within some period of time. – Hello and hold time: Hello packet sent every 3 seconds, hold time 10 seconds. More info about basic HSRP on Cisco Website here. AND – it requires that all the objects defined in the track list to be up. OR – it requires that at least one object to be up. See this link for more information about object tracking. One HQ site LAN (top of diagram). A remote site (bottom of diagram) that has one provider with 2 routers serving as default gateway for the local LAN for high availability. The remote network reaches the HQ LAN via MPLS network of the provider. Internet access is done locally on the same router device. 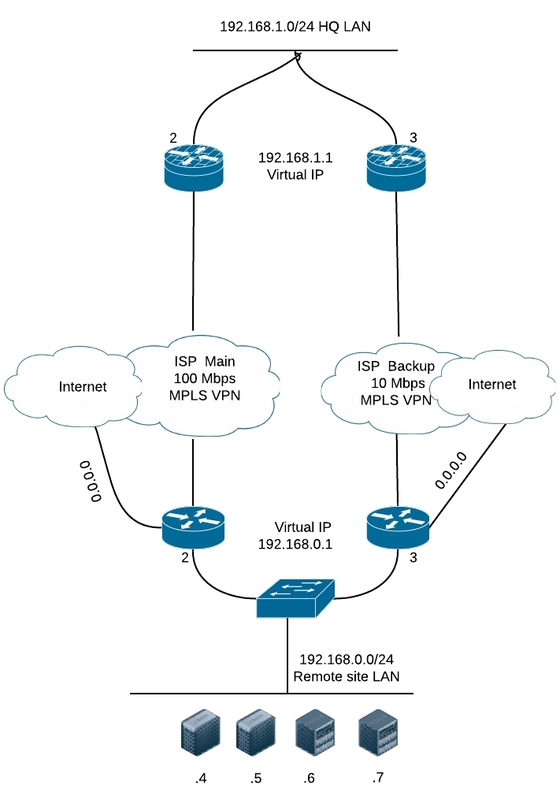 Provide high availability for both the VPN and Internet access for the remote site. We are using for this example two Cisco 881-SEC-K9 routers with c880data-universalk9-mz.150-1.M7.bin image installed. Below is the configuration for tracking the VPN line. We will use IP SLA tracking with icmp echo sent via Vlan999 to the HQ router. To be sure we are reaching the LAN in HQ we will track it’s gateway virtual IP. Below is the configuration for tracking the internet line. Again we will use IP SLA tracking with icmp echo sent via FastEthernet4 to the internet. NOTE: The example address 100.100.100.100 shown above is the internet IP monitored. It can be your ISP default gateway or any other IP from the internet that sends icmp reply. Be careful because public services or providers can have ICMP blocked on their equipment and some pings may fail. Below is the tracking configuration with boolean object tracking so that if any of the IP SLA tracking mechanisms fail, the standby router will become active. After tracking is configured we can configure the HSRP on Vlan1. Assume that Vlan1 is the vlan facing the LAN of the two routers. NOTE: if any of the two objects goes down, track 3 goes down also. If I would have configured using the OR boolean statement, then for track 3 to go down both of the objects must go down. Configuration of Router 2 is done in the same way, the only difference is that the priority is left default (100). There are many applications for IP SLA monitoring with object tracking. Other examples will be covered in future articles. Thanks for the article. I would like to know if we have an ADSL backup with a Fiber active link, do you think we need extra configurations for the ADSL line. I know fiber link could be straight forward point to point but what about the ADSL if we are using dialer interface. You guidance will be really appreciated. If the ADSL connection is up then you can use IP SLA tracking just as the example with no problem. hello Sir haris great article.i have a question if we do not have HSRP like in above case we have VSS so how we combine Bolean track. VSS works on Layer2. HSRP works on Layer3. You can implement HSRP on routing devices and you can have VSS together.